What customers say about my bows. "Hello, my name is Torsten Nowak and I come from Schweinfurt-Germany. I saw The Tanasi Warrior in Joe’s YouTube video about five months ago and I thought this would be the perfect bow for me. 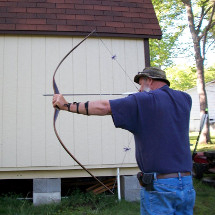 I have shot the compound, crossbow and longbow for many years. 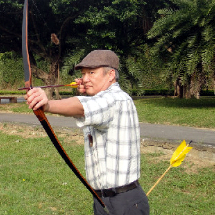 I have tried many different bows - Huns, Korean, Yumi and I like the Mongolian Raider bows and longbows. Joe’s Tanasi Warrior has a smooth draw, stability of a longbow, and the quickness of a recurve. 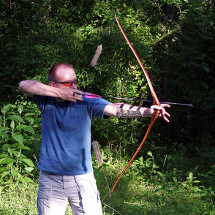 The bow is perfect for instinctive shooting. The bow is elegant and powerful, a perfect beauty. I waited 4 months for a bow that I had dreamed of for 20 years. Thank you Joe, my friend, for this nice bow!" "Hello. My name is Charles Gilardoni Bellagio on Lake Como, Italy. Turning on YouTube I saw the Tanasi Warrior. Struck me at first sight. I was wondering if there was the possibility of having one immediately by contacting Joe. I want to clarify, among other things, this person was very helpful and patient with me while he built my bow. He told me that he would be happy to build a bow for me because his wife had Italian origins. When the bow arrived I was astonished. The bow was very nice. Perfect impeccable workmanship. Not a single blemish. Very powerful, fast and accurate. I had been so long looking for a bow like this. Thank you very much friend Joe." 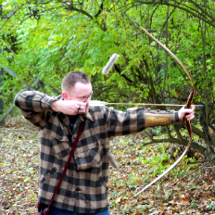 "Over the past couple years I have been searching for the perfect longbow. I have purchased or shot several bows from the top bowyers, all leaving me wanting something more. Then I saw Joe on youtube and his warrior longbow was vary intriguing to me. After talking to him I quickly placed an order. When the bow arrived I instantly knew I had found the one. This bow is so smooth, quiet, forgiving, and FAST. Above all, I would also like to add that Joe has quickly become a new found friend. I have worked with many bowyers and he is by far the easiest and nicest to work with. He is a good man and would recommend him to anyone I know. Thanks Joe!" 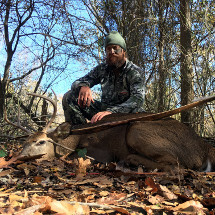 "I have been a passionate bow hunter/archer since I was 11 years old shooting compound bows. 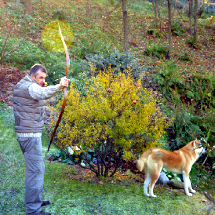 From the time I started I knew that someday I wanted to get into traditional archery. Doing some research online I stumbled across Joe's website and gave him a call. We ended up talking for over an hour that day as if we'd known each other for years and I knew that I wanted him to build me a bow. Once I put in my order with Joe I sold my compound, all the equipment that went with it, and haven't looked back. My bow is an absolute work of art and besides being pretty to look at it shoots amazing! With all the gimmicks available with today's technology in archery it's refreshing to get back to what's real. Joe is one of the most humble people you'll ever meet. Him and his family are some of the finest people you could ask to know and I now consider them to be close friends. You will not go wrong with one of Joe's custom Tanasi bows!"" "My name is Lendl Chiu and I live in Taipei, Taiwan (Formosa). 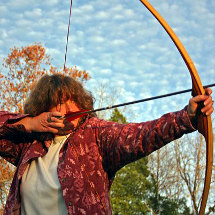 I have been so fond of archery since a kid and now I am 58 and still pulling hard. I like American traditional bows very much and have so many that none pulls the same to give me the same feeling. Chota, the bow I bought from Joe this year, is 54” and 53#@26”. This bow not only looks different but also feels absolutely different from the other bows I have. At just a bit over 50# and 8” brace height, the bow impresses me so much with the energy at the first touch on the string. It is a kind of confidence and then, consistent force that I can feel all the way through the pulling onto the anchor point. The feeling is unique. At my draw length 26”, 555 grain Easton Al. arrow 2020 shoots 172 fps. There are so many descriptions to express a bow, such as second to none, best of the best, look no further, smooth as silk and ... so on. But I would rather describe Chota like the relationship with a friend....INTIMATE." "My Tanasi bow is a striking combination of balance, smooth draw, exquisite craftsmanship and beauty! Joe was a pleasure to work with and his bow is sure to be a treasured heirloom in our family for a long time!" "What can I say. My new bow from Tanasi Bows is what archery dreams are made of. The absolute beauty of the wood selected, the riser carved to fit my grip exactly, and the smooth, confident draw only compliment the fact that my groupings are tighter than I have ever accomplished before. 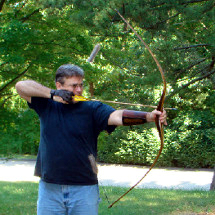 In the typical Joe style, he brushed off the posibility that his bow would be the cause of my instant improvement, instead putting the credit on my having been practicing. Truth be told, I hadn't shot in many months, and was actually quite rusty! I truely believe that the fit, smooth draw, and balanced feel of the Chota model has made me a better shooter. It feels like a natural extension of the body. Joe tries to lay the credit on me, but I know better! This is the second Tanasi Bow in our house. Joe made a bamboo backed longbow for my wife. We feel truely blessed to own such exquisit, functional pieces of art! Thank you Joe; you are a phenominal bowyer and an invaluable friend!" 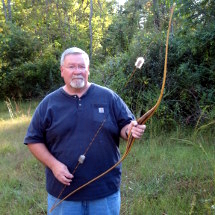 "I just bought a really sweet bow from Joe Darnell at Tanasibows.com, the Tanasi Warrior." "My name is Jeff Kirkland, and I’ve been shooting long bows and recurves for several years now. I build bows, and I’ve shot about every bow on the market; but when I met Joe a couple of years ago, I was impressed by the style and performance of his bows, not to mention his personality. I have shot several of his bows, and my favorite is the Tanasi Warrior with the finger grips. I’ve been looking for a high-performance bow without a heavy draw weight, and it looks like I’ve found it. Thanks Joe!" "I'm Jack Peters and I bought a bow from Joe several months ago. The bow is really a work of art, and a great shooter. I am really impressed with the craftsmanship, and I really love the way this bow shoots. It is my first custom bow and I am really pleased." "I contacted Joe Darnell after months of internet research (visiting over 51 different custom bow sites), reading reviews, testimonials, etc. I just kept being drawn back to his site and looking at the Tanasi Warrior again and again. There is just something about the design that appeals to me far more than the traditional recurve and longbow styles. He answered all of my questions and just made me feel comfortable that I was making the right choice. I really like that he does basically everything by hand and that it is a passion for him. "My Tanasi Warrior bow arrived nicely packaged in a PVC tube for protection. After pulling it out of the packaging I was surprised to find that it came with a fleece bow sock, which is great. The first thing I noticed, after removing the sock, was how lightweight the bow is. The second thing I noticed was that the bow was absolutely gorgeous, far exceeding my expectations. Joe had sent pictures but, to see it in person was far more impressive. The bow has a wenge riser and bocote limbs, both with really nice grain patterns, and they just complement each other really well, in my opinion. I wanted some contrast between the limbs and riser but, not too much and the combination is just what I was hoping for. Joe’s craftsmanship and the fit and finish of the bow are incredible. Everything is perfectly symmetrical, balanced and smooth. The one thing I was unsure of with the Tanasi Warrior design was how the handle would feel to me since I hadn’t ever tried anything similar. Well, it fits my hand perfectly and just feels completely natural. When I first shot the bow I was surprised by how quiet it was. I didn’t hear any string noise at all, just the smack of the arrow hitting the target. I don’t feel any vibration after the shot either. I am pretty new to traditional archery and shooting instinctively so unfortunately I can’t say I am splitting shafts, yet. But, I can say that this bow has significantly increased my confidence and I am much more consistently with it than any other bow I have shot. I am a very satisfied customer and highly recommend Tanasi Bows. If you are looking for a high quality, high performance traditional bow a Tanasi Warrior will do you proud." "I am Clay Warren from Oak Ridge, Tennessee. I recently recieved my Tanasi warrior and have been beyond pleased with my bow's look and feel. It shoots like a dream and I have had just about everyone who picks it up say that it is the most beautiful bow they have ever seen. Joe has really helped me as I am relatively new to traditional archery. He is very knowledgable about traditional archery. He is passionate about his bows and you will be able to tell the first time you shoot and look at one." 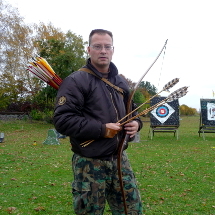 "I am Wayne Hess from Pennsylvania and a fan of traditional archery. I particularly like the looks of the Asian or Turkish-style bows. There are not more than a handful of bowyers making these styles with modern materials. When I saw the advertisement for the Tanasi Warrior long bow I googled it. It was made by bowyer, Joe Darnell. I decided to call him to talk about his bows. I enjoyed talking with him, he is a very pleasant man to converse with. 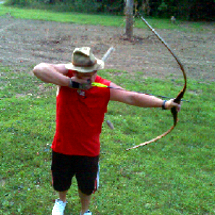 The result of that conversation was that Joe made me a Tanasi Warrior long bow. I received a bow that looked GREAT!! The craftsmanship was terrific and the finish superb! 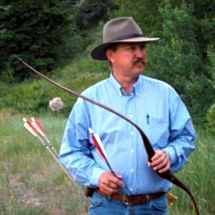 If there is a word such as "Bow-love", Joe built it right into this bow. I love to shoot it! 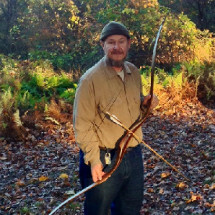 I have several longbows by Fedora, Leon Stewart, and Toelke and this bow shoots right at the top of the line! 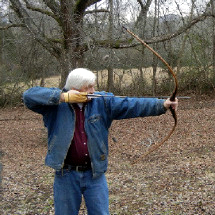 The Tanasi Warrior Long Bow is a great bow. It's in a class of its own. I am truly happy with the bow. I love how it shoots. I love the look of the Bocote and Wenge combo. It is an awesome bow! Thanks Joe for a fantastic bow!"